Pictured, from left, are Scott Werstler, Matt Long, Carrie Hoffman, Brandon Penrod, and Bill Patrick. SOUTH WHITLEY — The resignation of Pierceton Elementary School Principal Mike McClain was announced during the Whitko School Board meeting Monday, March 18. Dr. Brandon Penrod, Whitko School Corporation superintendent, read McClain’s letter of resignation to the board. His resignation will be effective June 30 of this year. In other business, Ward Lamon, curriculum director, told the board that Whitko Community Schools was chosen by the Indiana Department of Education to be a digital leadership model for the state. During the meeting, Penrod discussed a house bill in the Indiana state legislature regarding school funding. For the 2020 funding increase, charter schools would receive an 11.35 percent increase, while public schools would receive a 1.59 percent increase. Penrod recommended the public contact local legislators regarding the proposed bill. Whitko Jr./Sr. 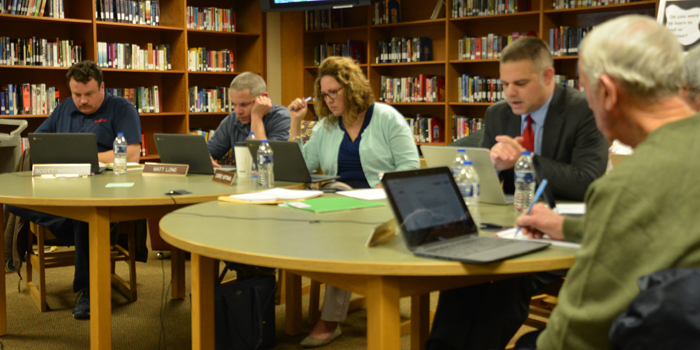 High School Principal John Snyder also discussed changes to the school’s course guidebook. With the new updates and additions to courses, students will have the opportunity to potentially earn more than 60 college credits at Whitko. In the next school year, there will be new courses in agriculture, business, mathematics, performing arts, and physical education. “We’ve tried to have the balance to add courses that will have the most bang for the buck for our students,” said Snyder. Kosciusko County Community Foundation made a donation to Pierceton Elementary School in the amount of $1,350 to purchase a water bottle filling station. This donation matches a donation made by the Pierceton Elementary School PTO, allowing the school to install two filling stations this summer. The school is continuing to seek a donation to purchase a third water filling station. The board also congratulated Whitko Jr./Sr. High School’s archery group for being the 2019 Indiana Middle Division NASP/IBO 3D state champions. Whitko High School art students were also recognized. To date, the school’s art students have received 40 state, 43 national, and 202 international awards. The sophomore art group will be recognized at the Indiana General Assembly March 28. Whitko Jr./Sr. High School’s spring musical “Where’s Charlie?” will have performances on Friday, March 22 and Saturday, March 23. Whitko High School announced Samuel Mark Rickerd and Livia Elise Rose as its Class of 2019 valedictorian and salutatorian, respectively. The board approved two field trips for the Whitko Varsity Girls’ Soccer Program and the Whitko Marching Band. The board heard a presentation from Teresa Knepple, Whitko Middle School science teacher, regarding Lego Robotics. Pierceton Elementary School will hold its talent show Friday, March 22. Whitko Jr./Sr. High School will hold a mattress sale fundraiser Saturday, March 23. The board’s next meeting will take place at 6:30 p.m. Monday, April 15, at South Whitley Elementary School.